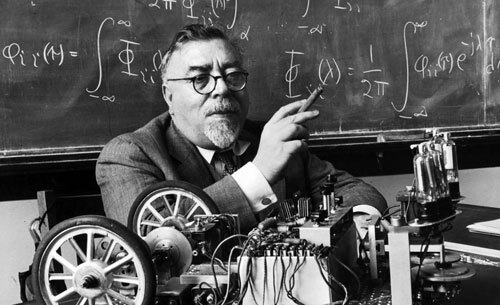 Norbert Wiener (1894–1964) was a remarkable man. He was born in the American-Jewish family of Leo Wiener (Russian-Polish-Jewish origin) (1862–1939) and Bertha Kahn (German-Jewish). Norbert's father Leo (born in Byelostok in Tsarist Russia and came to USA in 1880) was an American historian, linguist, author and translator, remarkable polyglot (Leo knew more than twenty languages). Since 1896 Leo taught at the cathedra of Slavic cultures at Harvard University and became the first American professor of Slavic literatures. The young Norbert (see the lower image) was a child prodigy, educated at home by his father. 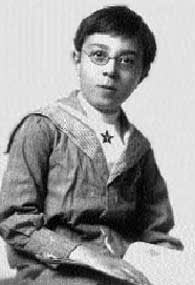 After graduating from Ayer High School in 1906 at 11 years of age, Norbert entered Tufts College. 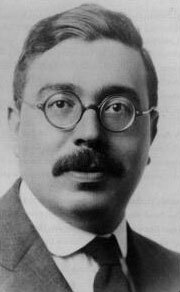 He was awarded a BA in mathematics in 1909 at the age of 14, whereupon he began graduate studies in zoology at Harvard, obtaining a Ph.D. degree in 1912. Later Wiener made significant contributions in mathematics, and pioneering contributions to electronic engineering, computer science, artificial intelligence, robotics, computer control and automation. He is titled as father of cybernetics. Wiener's strangeness was proverbial in the scientist's circles. Some people laugh at his somewhat baroque, short, rotund, and myopic figure, his wanton and pompous speech, but in contrast to most of them, he shared his theories and findings with other researchers, and credited the contributions of others. These included Soviet researchers and their findings (it was very dangerous and placed him under suspicion during the Cold War). He was a strong advocate of automation to improve the standard of living, and to overcome economic underdevelopment. He declined an invitation to join the Manhattan Project. After the war, he became increasingly concerned with what he saw as political interference in scientific research, and the militarization of science. His 1947 article "A Scientist Rebels" urged scientists to consider the ethical implications of their work. After the war, he refused to accept any government funding or to work on military projects. During World War II, Wiener worked on guided missile technology, and studied how sophisticated electronics used the feedback principle, as when a missile changes its flight in response to its current position and direction. He noticed that the feedback principle is also a key feature of life forms from the simplest plants to the most complex animals, which change their actions in response to their environment. Wiener developed this concept into the field of cybernetics, concerning the combination of man and electronics, which he first published in his 1948 book Cybernetics. Wiener's vision of cybernetics had a powerful influence on later generations of scientists, and inspired research into the potential to extend human capabilities with interfaces to sophisticated electronics, such as the user interface studies conducted by the SAGE program. Wiener changed the way everyone thought about computer technology, influencing several later developers of the Internet, most notably Licklider. ... society can only be understood through a study of the messages and communication facilities which belong to it; and that in the future development of these messages and communication facilities, messages between man and machines, between machines and man, and between machine and machine, are destined to play an ever increasing part. ...information is a name for the content of what is exchanged with the outer world as we adjust to it, and make our adjustment felt upon it. The purpose of Cybernetics to develop a language and techniques that will enable us indeed to attack the problem of control and communication in general, but also to find the proper repertory of ideas and techniques to classify their particular manifestations under certain concepts. Thus, he defines the problem with communication in terms of control and system malfunctions through the understanding of the Cybernetic theory.